The TS-473 is powered by a high-performance and energy-efficient AMD R-Series CPU and provides two PCIe slots for greater functionality. 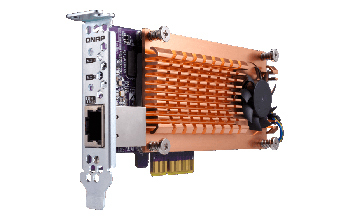 You can install a QNAP QM2 expansion card to add M.2 SSD caching/10GbE connectivity; a compatible wireless card to use the TS-473 as a wireless access point; and an entry-level graphics card to boost system performance for 4K video performance. The TS-473 allows you to flexibly deploy a wide range of applications with a more affordable budget. 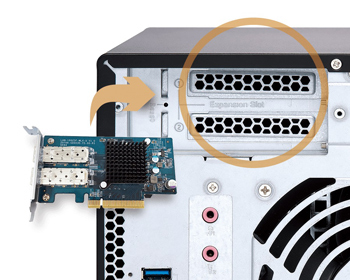 The TS-473 features SSD caching, and also supports optional M.2 SATA 6Gb/s SSDs (sold separately). Using an SSD cache boosts overall system performance, and is perfect for improving the overall workflow of random IOPS demanding applications such as virtualization. 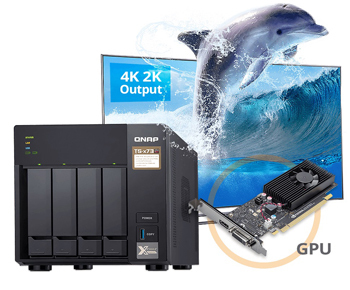 QNAP’s Qtier™ technology also continuously optimizes storage efficiency by tiering files and data across M.2 SSD, 2.5-inch SSD, and high-capacity SATA drives based on access frequency. The new Qtier™ 2.0 features IO-awareness that empowers SSD-tiered storage with a cache-like reserved space to handle burst I/O in real time, greatly maximising the advantages of SSD.